30A Escapes presents... "Sail Away"
Sail away with us to paradise and stay in a beautiful newly constructed home in the heart of Seacrest Beach!!! 30a Escapes is pleased to present… “Sail Away!” Located only steps away from the shops and restaurants of the Seacrest Beach village and a short stroll or tram ride to the beach access, this roomy six bedroom and four bath home has something to offer everyone in the family for a vacation you’re all sure to remember. The home is also pet friendly for those who can's stand to leave their fur babies behind. Five bikes are provided with this property making navigating to the attractions of Seacrest and Rosemary Beaches a short, adventurous and enjoyable trip. 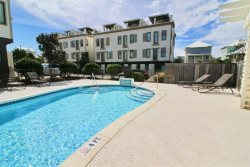 A zero entry pool with splash pad fountains for the little kids, a deeper pool for bigger kids and grown ups, a large hot tub, and two gas grills for your use are all just steps away from your door! No off-street parking or walking necessary for this home. The spacious garage can accommodate two vehicles or park those 2 cars in the driveway and utilize the garage as a game room! Roll out the ping pong table for a fun tournament or play some games on the multi-game arcade. Don't worry, you won't miss the big game as there is also a TV for your convenience. With all of this there is still room for boot bins and hooks to house all your beach toys and sandy shoes after returning from the beach! Upon entering the home, the first thing you’ll notice after entering through the side door is the gorgeous brand-new hardwood floors and the beachy décor accenting the room. You’ll find a set of full size bunks sleeping up to two small children a piece or one adult each in the corner of the first room. The room adjacent to the bunks is the first full bedroom containing a king size bed and en suite bathroom. Across from the entry door you can see the stairs winding brilliantly up to the second floor: the door to the ever so convenient elevator located next to them. Imagine no lugging suitcases up-stairs or having to worry about those with physical impairments being able to enjoy the entire house. On the second floor, Sail Away provides a stunning fully equipped kitchen with state of the art appliances and a comfortable soothing color palate; a perfect place to relax, cook a family meal and unwind. Next to the kitchen spectacular lighting hangs above the dark stained wooden dining table setting the mood for precious family moments. Off the kitchen there is a nice sized bunk room containing a twin over twin bunk and attached bathroom. The rest of the second floor consists of a lazy living area with brand new smart televisions with complimentary HDMI hook ups and extensions for gaming and devices. While the kids are having fun in the living room laughing and playing games, Mom and Dad can escape to the small balcony on both front and back sides of the house for a nice glass of wine. The third floor contains the final two bedrooms and the master suite. The two bedrooms are both equipped with king sized beds and large smart televisions. The beautiful countertops on the double vanity in the shared hallway bathroom is sure to make anyone feel right at home. The Master suite is at the end of the hallway. Featuring a large closet equipped with pack n plays, a new king-sized bed facing a large new smart television and an en suite bathroom, this master suite is everything you could ask for a relaxing nights rest. The bathroom has a separated water closet, glass door shower, double vanity and deep soaking tub for those nights relaxing after dinner. Come escape the worries and frustrations of every-day life and “Sail Away” for a sun drenched siesta in Seacrest Beach!